These are many of my publications in The Tablet of London. The Tablet of London is an independent Catholic weekly published since 1840 and distributed internationally with a circulation of over 19,000. They are available in pdf files with a subscription to the magazine. The “Parish Practice” page focuses on architecture supporting the ritual celebration of liturgy. The “Listen to the Word” page provides commentaries on the prayers of the Missale Romanum. Five articles in the list below are by James Leachman, as indicated. “Gather them in”, Parish Practice, The Tablet (25 May 2013) 13. “Be guided by the light”, Parish Practice, The Tablet (27 April 2013) 13. “From there to eternity”, Parish Practice, The Tablet (10 November 2012) 16. “It’s the taking part”, Parish Practice, The Tablet (6 October 2012) 16. “Stand up for the Lord”, Parish Practice, The Tablet (25 August 2012) 13. “Home from home”, Parish Practice, The Tablet (28 July 2012) 15. “To and from the living waters”, Parish Practice, The Tablet (16 June 2012) 12. “Mix and match”, Parish Practice, The Tablet (5 May 2012) 16. “Becoming light”, Parish Practice, The Tablet (7 April 2012) 22. “Discoveries at an empty tomb”, Parish Practice, The Tablet (3 March 2012) 16. “Caught between heaven and earth”, Parish Practice, The Tablet (14 January 2012) 15. “Intimate encounters”, Parish Practice, The Tablet (17/24 December 2011) 29. Commentaries on selected prayers of Sundays and Feasts of the Missale Romanum. “Faithful lines”, Listen to the Word, The Tablet (26 November 2011) 13-14. “Justice, love, peace”, Listen to the Word, The Tablet (19 November 2011) 14. “Temples of the soul”, Listen to the Word, The Tablet (12 November 2011) 14. “Fit for a nuptial feast”, Listen to the Word, The Tablet (5 November 2011) 16. “Saints among us”, Listen to the Word, The Tablet (29 October 2011) 16. “Place for a banquet”, Listen to the Word, The Tablet (22 October 2011) 15. “Caring for people”, Listen to the Word, The Tablet (15 October 2011) 16. “Reasons to serve”, Listen to the Word, The Tablet (8 October 2011) 19. “Guiding hands of God”, Listen to the Word, The Tablet (1 October 2011) 15. “Towards the way”, Listen to the Word, The Tablet (24 September 2011) 15. “Divine reconciliation”, Listen to the Word, The Tablet (17 September 2011) 15. “Sins blotted out by his blood”, Listen to the Word, The Tablet (10 September 2011) 15. 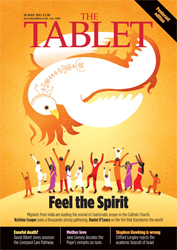 “Eagerly serving all people”, Listen to the Word, The Tablet (3 September 2011) 16. “Give thanks and glorify”, Listen to the Word, The Tablet (27 August 2011) 13. “Drawn up to the Trinity”, Listen to the Word, The Tablet (20 August 2011) 14. “Brought to glory”, Listen to the Word, The Tablet (13 August 2011) 14. “Traditions united”, Listen to the Word, The Tablet (6 August 2011) 16. “Undetermined by death”, Listen to the Word, The Tablet (30 July 2011) 14. “Saved by praise”, Listen to the Word, The Tablet (23 July 2011) 15. “From thanks to praise”, Listen to the Word, The Tablet (16 July 2011) 16. “Redeemed with mercy”, Listen to the Word, The Tablet (9 July 2011) 15. “Symphony of voices”, Listen to the Word, The Tablet (2 July 2011) 16. “Cosmic intentions”, Listen to the Word, The Tablet (25 June 2011) 16. “Distinct without division”, Listen to the Word, The Tablet (18 June 2011) 15. “A work completed”, Listen to the Word, The Tablet (11 June 2011) 15. “Cosmic praise”, Listen to the Word, The Tablet (4 June 2011) 16. “Lowliness on high”, Listen to the Word, The Tablet (28 May 2011) 14. “Renewed and integrated”, Listen to the Word, The Tablet (21 May 2011) 15. “Ever giving”, Listen to the Word, The Tablet (14 May 2011) 15. “In that great sacrifice”, Listen to the Word, The Tablet (7 May 2011) 13. “Return to the font”, Listen to the Word, The Tablet (30 April 2011) 14. “By the blood of the lamb”, Listen to the Word, The Tablet (23 April 2011) 25. “The Lord comes”, Listen to the Word, The Tablet (16 April 2011) 16. Leachman, J., “Led to new life”, Listen to the Word, The Tablet (9 April 2011) 18. Leachman, J., “About to be reborn”, Listen to the Word, The Tablet (2 April 2011) 14. Leachman, J., “Kindling of love”, Listen to the Word, The Tablet (26 March 2011) 14. “A different form”, Listen to the Word, The Tablet (19 March 2011) 16. “Ahead to Easter”, Listen to the Word, The Tablet (12 March 2011) 18. “Loved through the Son”, Listen to the Word, The Tablet (5 March 2011) 18. “Awaiting fulfilment”, Listen to the Word, The Tablet (26 February 2011) 14. “Made to govern”, Listen to the Word, The Tablet (19 February 2011) 15. “Heaven’s gates unlocked”, Listen to the Word, The Tablet (12 February 2011) 17. “Glory to help, provide, save”, Listen to the Word, The Tablet (5 February 2011) 13. “Drawn in by candlelight”, Listen to the Word, The Tablet (29 January 2011) 13. “Living eternally now”, Listen to the Word, The Tablet (22 January 2011) 14. “Naming our glory”, Listen to the Word, The Tablet (15 January 2011) 15. “Witness to marvellous signs”, Listen to the Word, The Tablet (8 January 2011) 14. “Light of his glory”, Listen to the Word, The Tablet (1 January 2011) 18. “All things lifted up: Preface II of the birth of the Lord “, Listen to the Word, The Tablet (18/25 December 2010) 32. “All things lifted up: Preface III of the birth of the Lord”, Listen to the Word, The Tablet (18/25 December 2010) 32-33. “Glory in humanity“, Listen to the Word, The Tablet (11 December 2010) 14. “Confession of the faith“, Listen to the Word, The Tablet (4 December 2010) 13. “Two comings of Christ“, Listen to the Word, The Tablet (27 November 2010) 15. “Thanks be to God“, Listen to the Word, The Tablet (20 November 2010) 14-15. “Thy kingdom come“, Listen to the Word, The Tablet (13 November 2010) 16. “For love of God“, Listen to the Word, The Tablet (6 November 2010) 16. “In our humanity, divinity”, Listen to the Word, The Tablet (30 October 2010) 15. “How to become a saint“, Listen to the Word, The Tablet (23 October 2010) 16. “Realising hopes“, Listen to the Word, The Tablet (16 October 2010) 11. “With increasing clarity“, Listen to the Word, The Tablet (9 October 2010) 16. “Reaching out in love“, Listen to the Word, The Tablet (2 October 2010) 14. “Hands extended“, Listen to the Word, The Tablet (25 September 2010) 34. “In giving, we receive”, Listen to the Word, The Tablet (18 September 2010) 24. “Take hold of life“, Listen to the Word, The Tablet (11 September 2010) 19. “Getting results“, Listen to the Word, The Tablet (4 September 2010) 19. “Divinity in humanity“, Listen to the Word, The Tablet (28 August 2010) 15. “Awakening to serve“, Listen to the Word, The Tablet (21 August 2010) 15. “Come together“, Listen to the Word, The Tablet (14 August 2010) 15. “The road to perfection“, Listen to the Word, The Tablet (7 August 2010) 18. “Our promised inheritance“, Listen to the Word, The Tablet (31 July 2010) 15. “From the beginning“, Listen to the Word, The Tablet (24 July 2010) 15. “Divine echo “, Listen to the Word, The Tablet (17 July 2010) 16. “From inflamed to renewed“, Listen to the Word, The Tablet (10 July 2010) 16. “Discerning light“, Listen to the Word, The Tablet (3 July 2010) 16. “From day to day“, Listen to the Word, The Tablet (26 June 2010) 15. “Life that bears fruit“, Listen to the Word, The Tablet (19 June 2010) 16. “Creator and recreator“, Listen to the Word, The Tablet (12 June 2010) 16. “May they be one“, Listen to the Word, The Tablet (5 June 2010) 16. “Distinct but undivided“, Listen to the Word, The Tablet (29 May 2010) 15. “United in the Spirit“, Listen to the Word, The Tablet (22 May 2010) 16. “Arrived already“, Listen to the Word, The Tablet (15 May 2010) 16. “Living liturgy“, Listen to the Word, The Tablet (8 May 2010) 15. “Mystery ever growing“, Listen to the Word, The Tablet (1 May 2010) 20. “Unexpected shepherd“, Listen to the Word, The Tablet (24 April 2010) 17. “Flesh made glorious“, Listen to the Word, The Tablet (17 April 2010) 14. “Human actions done divinely“, Listen to the Word, The Tablet (10 April 2010) 16. “Living in light“, Listen to the Word, The Tablet (3 April 2010) 22. “For the good of others“, Listen to the Word, The Tablet (27 March 2010) 19. “Inspired to give“, Listen to the Word, The Tablet (20 March 2010) 17. “Illuminated by grace“, Listen to the Word, The Tablet (13 March 2010) 19. “Alive in us“, Listen to the Word, The Tablet (6 March 2010) 17. “Glory here and now“, Listen to the Word, The Tablet (27 February 2010) 18. “Hunger to live“, Listen to the Word, The Tablet (20 February 2010) 18. “Robed with new dignity“, Listen to the Word, The Tablet (13 February 2010) 14. “Guarded by goodness“, Listen to the Word, The Tablet (6 February 2010) 15. “Out of mortality, a remedy”, Listen to the Word, The Tablet (30 January 2010) 15. “Highly gifted fully human“, Listen to the Word, The Tablet (23 January 2010) 17. “Made to govern Creation“, Listen to the Word, The Tablet (16 January 2010) 16. “Anointed by the Spirit“, Listen to the Word, The Tablet (9 January 2010) 15. “Immortal glory restored“, Listen to the Word, The Tablet (2 January 2010) 17. “Born with ineffable love: Fourth Sunday of Advent”, Listen to the Word, The Tablet (19/26 December 2009) 30. “Born with ineffable love: Christmas Mass during the night”, Listen to the Word, The Tablet (19/26 December 2009) 31. “Hidden in our midst“, Listen to the Word, The Tablet (12 December 2009) 16. “Between two comings“, Listen to the Word, The Tablet (5 December 2009) 19. “First run, then walk”, Listen to the Word, The Tablet (28 November 2009) 15-16. “His endless reign“, Listen to the Word, The Tablet (21 November 2009) 16. “Renew your love life“, Listen to the Word, The Tablet (14 November 2009) 20. “Truth without pretence“, Listen to the Word, The Tablet (7 November 2009) 14. “For all the saints“, Listen to the Word, The Tablet (31 October 2009) 14. “Out of the embers“, Listen to the Word, The Tablet (24 October 2009) 16. “Sacred patterns of life“, Listen to the Word, The Tablet (17 October 2009) 16. “Divinity flies down“, Listen to the Word, The Tablet (10 October 2009) 16. “Out of captivity“, Listen to the Word, The Tablet (3 October 2009) 17. “From suffering to glory“, Listen to the Word, The Tablet (26 September 2009) 17. “Living the mysteries“, Listen to the Word, The Tablet (19 September 2009) 17. “An abiding gift“, Listen to the Word, The Tablet (12 September 2009) 16. “A shared life“, Listen to the Word, The Tablet (5 September 2009) 16. “For God in others“, Listen to the Word, The Tablet (29 August 2009) 14. “Healed through love“, Listen to the Word, The Tablet (22 August 2009) 16. “Mary lights our way“, Listen to the Word, The Tablet (15 August 2009) 15. “Through the course of life“, Listen to the Word, The Tablet (8 August 2009) 16. “Transformed and redeemed“, Listen to the Word, The Tablet (1 August 2009) 18. “Saved by a gift“, Listen to the Word, The Tablet (25 July 2009) 16. “From oldness to newness“, Listen to the Word, The Tablet (18 July 2009) 16. “Transforming mystery“, Listen to the Word, The Tablet (11 July 2009) 17. “Unending in our praise“, Listen to the Word, The Tablet (4 July 2009) 16. “In the household of God“, Listen to the Word, The Tablet (27 June 2009) 16. “God of gentleness“, Listen to the Word, The Tablet (20 June 2009) 16. “Share in divinity“, Listen to the Word, The Tablet (13 June 2009) 17. “A spark of majesty“, Listen to the Word, The Tablet (6 June 2009) 16. “Both gift and giver“, Listen to the Word, The Tablet (30 May 2009) 18. “The unseen actor“, Listen to the Word, The Tablet (23 May 2009) 17. “Sweet and strong“, Listen to the Word, The Tablet (16 May 2009) 19. “From old to new“, Listen to the Word, The Tablet (9 May 2009) 17. “God the shepherd“, Listen to the Word, The Tablet (2 May 2009) 21. “Mystery made personal“, Listen to the Word, The Tablet (25 April 2009) 18. “Grasping after God“, Listen to the Word, The Tablet (18 April 2009) 18. “Called out of the darkness“, Listen to the Word, The Tablet (11 April 2009) 28. “Striving for the sacred gift“, Listen to the Word, The Tablet (4 April 2009) 16. “Baptism affirmed“, Listen to the Word, The Tablet (28 March 2009) 18. “He enlightens all hearts“, Listen to the Word, The Tablet (21 March 2009) 15. “Mystery within“, Listen to the Word, The Tablet (14 March 2009) 19. “Good to be here“, Listen to the Word, The Tablet (7 March 2009) 18. “Refreshment from heaven“, Listen to the Word, The Tablet (28 February 2009) 16. “Salvation assured“, Listen to the Word, The Tablet (21 February 2009) 18. “Daily bread from Heaven“, Listen to the Word, The Tablet (14 February 2009) 16. Leachman, J., “Unifying fruit“, Listen to the Word, The Tablet (7 January 2009) 17. “Sacred aid to faith“, Listen to the Word, The Tablet (31 January 2009) 16. “New life, freely given”, Listen to the Word, The Tablet (24 January 2009)15. “Feasting together“, Listen to the Word, The Tablet (17 January 2009) 15. “His daughters and sons“, Listen to the Word, The Tablet (10 January 2009) 17. “Lead, kindly light“, Listen to the Word, The Tablet (3 January 2009) 14. “A saving festivity: Prayer after communion: Fourth Sunday of Advent”, Listen to the Word, The Tablet (20/27 December 2008) 30. “A saving festivity: Prayer after communion: Christmas, mass during the day“, Listen to the Word, The Tablet (20/27 December 2008) 31. “A saving festivity: Prayer after communion: The holy family of Jesus, Mary and Joseph“, Listen to the Word, The Tablet (20/27 December 2008) 31. “An appeal to gentleness“, Listen to the Word, The Tablet (13 December 2008) 16. “Stick to heavenly realities“, Listen to the Word, The Tablet (6 December 2008) 16. “Among passing things“, Listen to the Word, The Tablet (29 November 2008) 16. “Beyond conflict“, Listen to the Word, The Tablet (22 November 2008) 18. “To a blessed eternity“, Listen to the Word, The Tablet (15 November 2008) 16. “Great among the nations“, Listen to the Word, The Tablet (8 November 2008) 19. “Before us in glory“, Listen to the Word, The Tablet (1 November 2008) 16. “Worship and service“, Listen to the Word, The Tablet (25 October 2008) 18. “Maturing towards God“, Listen to the Word, The Tablet (18 October 2008) 16. “Prayers that rise like smoke“, Listen to the Word, The Tablet (11 October 2008) 18. “Sanctified by service“, Listen to the Word, The Tablet (4 October 2008) 14. “Accept and bless“, Listen to the Word, The Tablet (27 September 2008) 18. “In love and duty“, Listen to the Word, The Tablet (20 September 2008) 17. “Humbled yet exalted“, Listen to the Word, The Tablet (13 September 2008) 16. “In clouds of glory“, Listen to the Word, The Tablet (6 September 2008) 15. “Life-giving remedy“, Listen to the Word, The Tablet (30 August 2008) 16. “Once and for all“, Listen to the Word, The Tablet (23 August 2008) 16. “Glorious exchanges“, Listen to the Word, The Tablet (16 August 2008) 15. “Gifts given and received“, Listen to the Word, The Tablet (9 August 2008) 17. “Unity through the Spirit“, Listen to the Word, The Tablet (2 August 2008) 18. “Plentiful bounty“, Listen to the Word, The Tablet (26 July 2008) 13. “Sacrifice perfected“, Listen to the Word, The Tablet (19 July 2008) 21. “Food of sublime realities“, Listen to the Word, The Tablet (12 July 2008) 18. “The heavenly life“, Listen to the Word, The Tablet (5 July 2008) 16. “Apostolic defenders”, Listen to the Word, The Tablet (28 June 2008) 16. “Gifts freely made“, Listen to the Word, The Tablet (21 June 2008) 16. “Food for heart and soul“, Listen to the Word, The Tablet (14 June 2008) 17. “In which we serve“, Listen to the Word, The Tablet (7 June 2008) 16. Leachman, J., “Through a glass clearly”, Listen to the Word, The Tablet (31 May 2008) 15. “One bread, one cup, one Church”, Listen to the Word, The Tablet (24 May 2008) 16. “They also serve“, Listen to the Word, The Tablet (17 May 2008) 16. “With the boldness of the Spirit“, Listen to the Word, The Tablet (10 May 2008) 18. “The greatest gift“, Listen to the Word, The Tablet (3 May 2008) 16. “Growing into God“, Listen to the Word, The Tablet (26 April 2008) 20. “A holy transaction“, Listen to the Word, The Tablet (19 April 2008) 17. “Power of the paschal mysteries“, Listen to the Word, The Tablet (12 April 2008) 19. “Four kinds of joy“, Listen to the Word, The Tablet (5 April 2008) 16. “Happiness without end“, Listen to the Word, The Tablet (29 March 2008) 16. “Nourished by sacrifice“, Listen to the Word, The Tablet (22 March 2008) 28. “Through Passion to glory“, Listen to the Word, The Tablet (15 March 2008) 15. “Cleansed and inspired“, Listen to the Word, The Tablet (8 March 2008) 15. “Balm for the world“, Listen to the Word, The Tablet (1 March 2008) 15. “Forgiven and so forgiving“, Listen to the Word, The Tablet (23 February 2008) 17. “Act of mature faith“, Listen to the Word, The Tablet (16 February 2008) 16. “Fitting offering“, Listen to the Word, The Tablet (9 February 2008) 15. “How to consecrate the world“, Listen to the Word, The Tablet (2 February 2008) 18. “Deeper and deeper“, Listen to the Word, The Tablet (26 January 2008) 18. “Worthy way to celebrate“, Listen to the Word, The Tablet (19 January 2008) 15. “The Son revealed”, Listen to the Word, The Tablet (12 January 2008) 15. “Bread, wine and gold”, Listen to the Word, The Tablet (5 January 2008) 14. “Sacred exchanges: Prayer over the gifts: Fourth Sunday of Advent”, Listen to the Word, The Tablet (22/29 December 2007) 28-29. “Sacred exchanges: Prayer over the gifts: Nativity of our Lord mass during the night“, Listen to the Word, The Tablet (22/29 December 2007) 29. “Fulfilling his plan“, Listen to the Word, The Tablet (15 December 2007) 17. “Not by our merits alone“, Listen to the Word, The Tablet (8 December 2007) 17. “Delivered and brought to redemption“, Listen to the Word, The Tablet (15 September 2007) 16. “Taken up in glory“, Listen to the Word, The Tablet (11 August 2007) 14. “To our Creator and keeper“, Listen to the Word, The Tablet (4 August 2007) 17. “Through veneration to redemption“, Listen to the Word, The Tablet (9 June 2007) 15. “Glory and exultation“, Listen to the Word, The Tablet (19 May 2007) 18. “In newness of life“, Listen to the Word, The Tablet (7 April 2007) 26. “Sacrifice and banquet“, Listen to the Word, The Tablet (31 March 2007) 14. “A gift whole and complete“, Listen to the Word, The Tablet (3 March 2007) 13. “In thought and deed“, Listen to the Word, The Tablet (24 February 2007) 17. “Giving as one and many“, Listen to the Word, The Tablet (17 February 2007) 15. “Self-transcending gift“, Listen to the Word, The Tablet (10 February 2007) 18. “Just for today“, Listen to the Word, The Tablet (3 February 2007) 15. “Two commands, one love”, Listen to the Word, The Tablet (27 January 2007) 15. “Human impulse, divinely ordered“, Listen to the Word, The Tablet (20 January 2007) 17. “On earth and in heaven“, Listen to the Word, The Tablet (13 January 2007) 18. “In your house“, Listen to the Word, The Tablet (30 December 2006) 18. “Give us the grace for joy: The opening prayer: 3rd Sunday of Advent”, Listen to the Word, The Tablet (16/23 December 2006) 29-30. “Give us the grace for joy: The opening prayer: 4th Sunday of Advent”, Listen to the Word, The Tablet (16/23 December 2006) 30-31. “Give us the grace for joy: The opening prayer: Christmas mass during the day”, Listen to the Word, The Tablet (16/23 December 2006) 31. “From earth and from heaven“, Listen to the Word, The Tablet (9 December 2006) 17. “Between two comings“, Listen to the Word, The Tablet (2 December 2006) 22. “True kingship, truly shared”, Listen to the Word, The Tablet (25 November 2006) 17. “A talent for joy“, Listen to the Word, The Tablet (18 November 2006) 18. “Freed from snares“, Listen to the Word, The Tablet (11 November 2006) 19. “The one we serve“, Listen to the Word, The Tablet ( 4 November 2006) 17. “Constant promise“, Listen to the Word, The Tablet (28 October 2006) 19. “Perfect freedom“, Listen to the Word, The Tablet (21 October 2006) 16. “God’s love unfolding“, Listen to the Word, The Tablet (14 October 2006) 17. “Abundant in his compassion“, Listen to the Word, The Tablet (7 October 2006) 16. “Running towards God“, Listen to the Word, The Tablet (30 September 2006) 23. “Love of our neighbour“, Listen to the Word, The Tablet (23 September 2006) 22. “The gift of service“, Listen to the Word, The Tablet (16 September 2006) 16. “Reborn into freedom“, Listen to the Word, The Tablet (9 September 2006) 16. “Nourish good things in us“, Listen to the Word, The Tablet (2 September 2006) 17. “Hearts and minds freely won“, Listen to the Word, The Tablet (26 August 2006) 16. “From him all good things come“, Listen to the Word, The Tablet (19 August 2006) 16. “Intimate with a majestic God“, Listen to the Word, The Tablet (12 August 2006) 16. “Show us the splendour“, Listen to the Word, The Tablet (5 August 2006) 23. “The Lord is our steersman“, Listen to the Word, The Tablet (29 July 2006) 16. “Gifts of the Lord’s favour”, Listen to the Word, The Tablet (22 July 2006) 17. “Guided by the light of truth” Listen to the Word, The Tablet (16 July 2006) 15. “By humility to eternity“, Listen to the Word, The Tablet (8 July 2006) 15. “Love and awe“, Listen to the Word, The Tablet (24 June 2006) 16. “Without him we falter“, Listen to the Word, The Tablet (17 June 2006) 23. “Three into one is One“, Listen to the Word, The Tablet (10 June 2006) 14.
, Listen to the Word, The Tablet (3 June 2006) 18. “Till the end of time“, Listen to the Word, The Tablet (27 May 2006) 14. “To the rising Lord“, Listen to the Word, The Tablet (20 May 2006) 15.
, Listen to the Word, The Tablet (13 May 2006) 25. “Way of the shepherd“, Listen to the Word, The Tablet (6 May 2006) 16. “With joy and expectation”, Listen to the Word, The Tablet (29 April 2006) 18. “By water, Spirit and blood”, Listen to the Word, The Tablet (22 April 2006) 14. “Eternity unsealed”, Listen to the Word, The Tablet (15 April 2006) 28. “Suffering shared”, Listen to the Word, The Tablet (8 April 2006) 16. “Ones who walk in love“, Listen to the Word, The Tablet (1 April 2006) 22. “Rejoice and hasten“, Listen to the Word, The Tablet (25 March 2006) 21. “May we be raised up“, Listen to the Word, The Tablet (18 March 2006) 18.